Due to an incredible response, passes for this event are now entirely SOLD OUT! 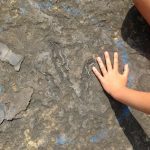 Passes will be on sale beginning March 1st on Eventbrite for $20 per vehicle (no maximum to vehicle occupants) to explore the Luck Stone Quarry in Culpeper and view the largest set of dinosaur tracks ever discovered in North America! Your pass will also allow free admission to the Museum of Culpeper History on July 13th and July 14th!